Once you become aware that the main business that you are here for is to know God, most of life's problems fall into place of their own accord. Comments on: "J. I. Packer Quotes: Once you become aware that the main business that you are here for..."
The Life of true holiness is rooted in the soil of awed adoration. 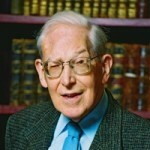 James Innell Packer is a British-born Canadian Christian theologian in the low church Anglican and Reformed traditions. He currently serves as the Board of Governors' Professor of Theology at Regent College in Vancouver, British Columbia. He is considered one of the most influential evangelicals in North America.